Most Taliban-aligned insurgent groups operate near their homes, and are motivated by local grievances. Talban spokespersons first mentioned the Red Group in 2016, when they were described as operating in Sangin. By the end of 2018, Taliban spokespersons have said that they are operating all across the country, including in many provinces where Taiban support is low. Rather than operating in a true “special operations” role, they seem to primarily be used to spearhead attacks against the Afghan National Army. 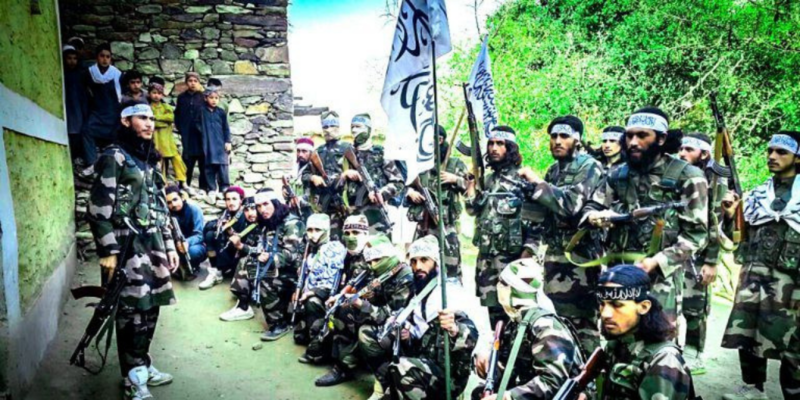 Interestingly, the Red Group was also allegedly involved in the “Battle of Darzab” against ISIL in Jowzjan Province. The Red Group is believed to be equipped with better equipment than the average Taliban fighter, and in fact, better than the average member of the Afghan National Army. They reportedly use night vision equipment, and a mix of old Russian weapons (such as the ubiquitous Kalashnikov but also Tokarev pistols) and captured modern ones (such as M4 carbines). The most striking thing about them in the videos, however, is their matching uniforms and and equipment. All are equipped with the kind of personal gear – elbow pads, knee pads, tactical gloves, helmets, chest rigs – that are the hallmarks of Western military units, and some of the better equipped Afghan National Army units as well. The Taliban have taken some steps to professionalize their forces, such as through the publication of a set of “rules” for all their members. There has been a lot of derisive commentary about the heavily produced videos released by the Taliban that show the Red Group training. It is little more than calisthenics, and many of the soldiers seem to have difficulty keeping up. Their weapon handling also seems amateurish, and not up to even a basic Western military standard. While these criticisms may be true, they also miss the point: whatever their military effectiveness, their real boon to the Taliban is as propaganda. When analyzing propaganda, there are three elements to consider: the message, the target audience, and the intended effect. Using this framework to consider the videos available showing the Sara Kheta, their purpose becomes more clear. The message in these images and videos is simply that the Taliban have modern, highly effective soldiers who are the equivalent of the Western Special Forces. And given that they are seen training in daylight with a Humvee captured from the Afghan National Army, able to fly the Taliban flag with impunity, it would seem that they are in control of parts of the country. The target audience for the videos and images can be deduced from the languages used in them – Dari, Pashto and Urdu. If this material was meant to convince Western audiences of the efficacy of the Red Force, they could easily have been produced or sub-titled in English. This has been seen in the propaganda effort of al Qaeda and other groups. The fact that the only languages used are local ones suggests that the target audience is the Afghan (and perhaps Pakistan) people alone. The Western pundit criticizing the handling drills on display misses the point that the intended audience is likely not looking at those things. The videos reinforce the perception among the general Afghan populace that the Taliban are a competent military force. They likely also appeal to potential recruits, who see the opportunity to join a military group who are equal to or better than the forces of the Afghan National Army. The presence of children observing the Red Group in the photo above, very similar to the common photos of children observing Western soldiers in Afghanistan, is very telling. Actual Special Forces operations in Afghanistan are typified by the night raid to kill or capture suspected insurgent leaders. There is a strong sense of the inviolability of the home in Afghanistan, and so the violence of such raids aside, they are seen as a cultural affront as well. The suddenness of these raids makes the Special Forces soldier somewhat of a “bogeyman” to Afghans, and so the suggestion that there is an equivalent Afghan force ready to fight them is also part of the message. The Afghan National Army and Police have been suffering a steady drumbeat of defeats across the country, and has suffered over 28,000 casualties since 2015 alone. There is no question that the insurgents, in general, are at least their match in combat. And while the actual military value of the Sara Kheta can be questioned, their value as a propaganda tool is undeniable.